Even with little experience, you can parlay related skills into a powerful resume. Looking to get your foot in the door of the healthcare industry by securing a nursing assistant job? Even with little experience, you can parlay related skills into a powerful resume, says resume expert Kim Isaacs. 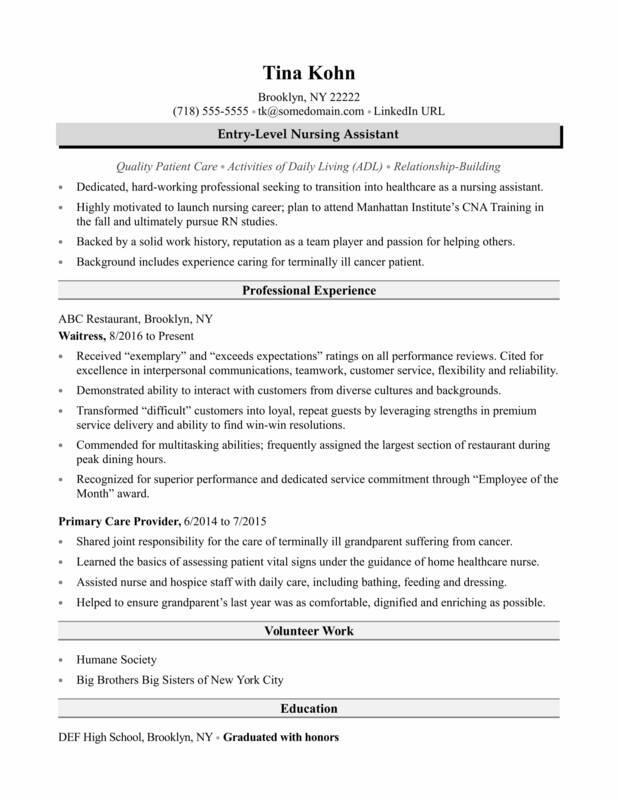 View the sample resume for an entry-level nursing assistant she created below and download the entry-level nursing assistant resume template in Word. Jobs for nursing assistants are projected to grow by 11% (or 177,700 jobs), which is faster than average, from 2016 through 2026, according to the Bureau of Labor Statistics (BLS). You'll find the highest level of employment for this job in the following states: California, New York, Florida, Texas, and Pennsylvania; and in the following metropolitan areas: New York City, Los Angeles, Chicago, Atlanta, and St. Louis. As a nursing assistant, you can expect to earn a median wage of $27,510 per year, or $13.23 per hour, according to the BLS. Dedicated, service-focused professional seeking to transition into healthcare as a nursing assistant. Highly motivated to launch nursing career; plan to attend Manhattan Institute’s CNA Training in the fall and ultimately pursue RN studies. Backed by a solid work history, reputation as a team player and passion for helping others. Background includes experience caring for terminally ill cancer patient. Received "exemplary" and "exceeds expectations" ratings on all performance reviews. Cited for excellence in interpersonal communications, teamwork, customer service, flexibility and reliability. Demonstrated ability to interact with customers from diverse cultures and backgrounds. Transformed "difficult" customers into loyal, repeat guests by leveraging strengths in premium service delivery and ability to find win-win resolutions. Commended for multitasking abilities; frequently assigned the largest section of restaurant during peak dining hours. Recognized for superior performance and dedicated service commitment through four-time awards as "Employee of the Month." Shared joint responsibility (along with mother) for the care of terminally ill grandparent suffering from cancer. Learned the basics of assessing patient vital signs under the tutelage of home healthcare nurse. Assisted home nurse and hospice staff with all aspects of daily care, including bathing, feeding and dressing. Helped to ensure grandparent's last year was as comfortable, dignified and enriching as possible. Before you apply to jobs, you want to make sure your resume is showing employers what you bring to the table. Could you use some help with that? Get a free resume evaluation today from the experts at Monster's Resume Writing Service. You'll get detailed feedback in two business days, including a review of your resume's appearance and content, and a prediction of a recruiter's first impression. It's a quick and easy way to start your career off on a strong note.